The recent promo of a chat show, actor Abhishek Bachchan and sister Shweta Bachchan were seen gracing the episode. One of the promo scenes showed the excited host, Karan Johar, asking Abhishek as to who scares him the most between his wife Aishwarya Rai Bachchan and mother Jaya Bachchan. To this, Abhishek’s quick reply was that it is his mother but the response was cut by Shweta as she immediately seized the moment to give a befitting reply in the middle of the question-answer session that Aishwarya scares him the most. Abhishek is next heard commanding her to be quiet as it was his rapid-fire round to which Shweta’s jaw drops. While Abhishek was seen donning a white T-shirt, paired with an orange colored jacket and teamed up with royal blue trousers, Shweta was seen donning a white fringes top with a choker neckline and a pair of black leather pants. Karan, on the other hand, wore a black shirt along with a black sequined blazer and a pair of trousers. The promo has sparked anxiety among viewers as they await this particular episode to be aired on television as it is evident through the medium of the promo that the brother-sister duo would be revealing a lot of things together on the show while Karan too seemed pretty excited after meeting them. This season of the show has been the most controversial one regarding the number of times it has been in news for its controversial exclusive interviews directly with the actors and actresses of the film industry. 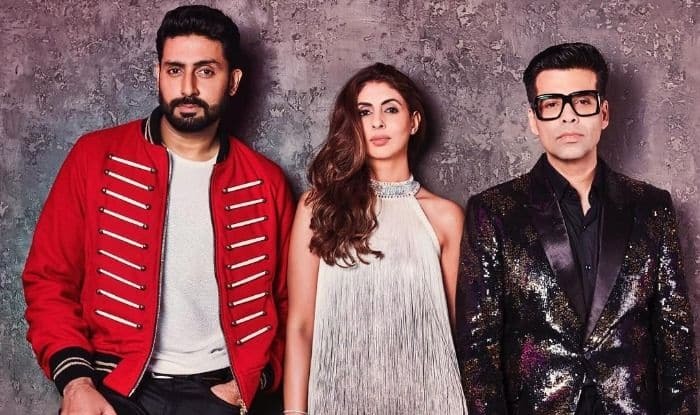 On the professional front, after taking a gap of two years from the movie world, Abhishek made a comeback into Bollywood with the movie Manmarziyaan alongside actress Tapsee Pannu and Vicky Kaushal of Uri fame, in 2018. The actor is currently shooting for another project by Anurag Basu.